Could there have been a ninth team in the Champions Trophy, made up of some exciting players overlooked for different reasons? There is much cricketing talent to be excited about at the Champions Trophy, but plenty of men who will be frustrated not to be a part of it too. Here is an XI, picked as an ODI side in batting order, of men who would have added to the tournament. The side is based on those who were fit to play and, in theory at least, available, which is why Kevin Pietersen, Jacques Kallis and Graeme Smith don't feature. Younis Khan would captain. 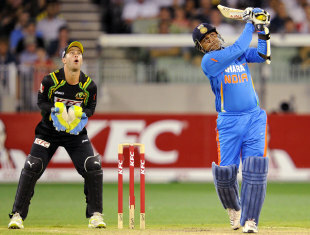 Only 11 innings after his ODI world record 219, Sehwag is not considered worthy of a place in India's squad. Given his rare ability to intoxicate with his lashing blade, that is a shame for neutrals. But perhaps less so for Indian fans, frustrated by his lackadaisical fielding and footwork that has gone from being minimal to positively dormant. He also only averages 22 in ODIs in England. England have a settled ODI batting line-up, even without Kevin Pietersen's belligerence. But Hales would have offered dynamism to the top of the order, with his powerful off-side driving and ferocious thumps over midwicket. Given his international Twenty20 average of 37, an ODI opportunity cannot be too far off. Pakistan's batting retains a familiar harum-scarum feel - much could go right but even more could go wrong. So it is surprising that the solidity, unobtrusive grace and technical fortitude of Younis has been ignored, even if an average of 17 in his last 18 ODIs explains why. After averaging only 20 since his comeback from cancer treatment, Yuvraj has not been granted the chance to return to the country of his audacious 69 in India's 2002 Natwest Trophy win. A poor IPL, during which Yuvraj's timing was as unfortunate as the corruption revelations which emerged in the days before the tournament final, rather vindicated the selectors' preference for realism over romance. Having spent his entire career overshadowed by big brother Michael, David even had the good grace to lose his international spot just after his brother's retirement. A perception that he suffered from an overly bottom-handed technique and difficulties against the short ball always lingered, though a first-class average of 65 for Nottinghamshire and proven boundary-clearing aptitude mean he can consider himself unfortunate. Theories abound for Matt Prior's ODI mediocrity, including his orthodoxy and constant shuffling around the batting order. Yet Prior is a better player now than during his 68 ODIs, having developed his range of shots and ability to go aerial. And in English conditions his resourcefulness could provide batting insurance in a way that Jos Buttler, for all his idiosyncratic ebullience, cannot. Prior's proficiency keeping to the moving ball would have also been an asset. Boom Boom may have finally gone bust. Only 15 wickets in his last 21 ODIs - plus a batting average of 19 - make Pakistan's decision to ditch Afridi wholly understandable. The sense that he has mislaid his bowling zip meant Pakistan could not justify picking him in the hope of his occasional blitzes with the blade, though a 48-ball 88 against South Africa in March showed how thrilling they can be. Despite his match-turning potential with bludgeoning blade, stump-shattering yorker and zestful fielding, West Indies' battery of allrounders left no room for Russell. His ODI record - averaging 30 with the bat and 31 with the ball - suggests this is unfortunate, though his bowling can be erratic. Worcestershire, for whom Russell will play Twenty20s, may be the beneficiaries of his frustration. He has barely been involved in South Africa's limited-overs plans, making just eight ODI appearances, but despite a very modest List A average of 35, Philander's nagging seam movement and ability to bowl the perfect length for English conditions could have been a potent weapon, especially with two new balls used. He was left out because of Australia's desire to protect him for the Ashes, but Pattinson's pace and late swing - plus the local knowledge of his brother Darren - would have increased Australia's chances of a hat-trick of Champions Trophy wins. So, too, would Ryan Harris: Australia decided to preserve his fragile body despite a record of 44 wickets from 21 ODIs at 19 apiece. Wagner has a heart that seems almost too big for his body. And he is never knowingly light on melodramatics, with his exuberant celebrations and look of incredulity whenever an appeal is turned down. Though he is yet to play an ODI, he's also a bowler of considerable craft and must have been close to selection after an injury to fellow left-armer Trent Boult. The mystique of Dananjaya - he has a googly, carrom ball and doosra - saw him elevated to Sri Lanka's World Twenty20 squad before he had even played a professional game, and he held his own admirably. Taking a 19-year-old mystery spinner to England in June might have been asking too much but Dananjaya would certainly have provided an alluring plan B.